February 2019 - Issue # 063 - The anti-inflammatory diet can be used for weight loss, healing and disease prevention. There is sure a lot of interest about anti-inflammatory diets these days and the good news is that there are also a whole lot of books and meal plans available for those who want to try it. Is it for you? Here is some information to help you decide if you want to try it. What Does an Anti-Inflammatory Diet Do? The main reason why people reach out for this diet is to try to heal themselves. 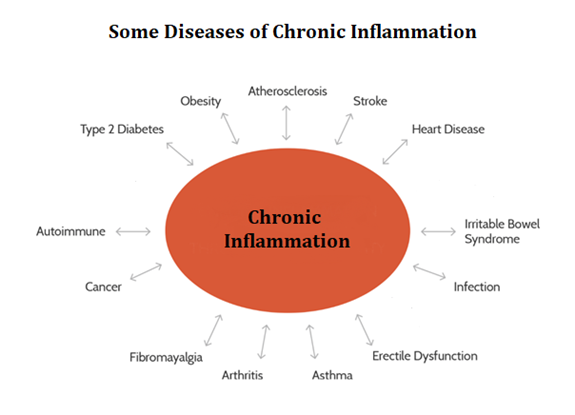 Chronic inflammation has become an epidemic and will cause a variety of illnesses such as arthritis, fibromyalgia, cancer, heart disease, diabetes, ulcerative colitis, chronic pain and many others. So in a nutshell, this diet encourages foods and beverages that will help reduce or omit inflammation in the body. Inflammation is the body’s way of fighting against things that can hurt us, such as infections and injuries. When the body feels there is something wrong, your immune system triggers a chemical reaction which increases the blood flow to the damaged area to help fix it. This is called acute inflammation, which means its short term until you’re healed. But today’s big problem is chronic inflammation; this is an inflammation that doesn't want to go away, keeping your body in this state of panic. If it continues this constant inflammation will start hurting your organs and tissues which can then lead to disease or illness. What Are Symptoms of Chronic Inflammation? Acute inflammation can cause symptoms such as swelling, redness or pain, but with chronic inflammation the symptoms may be milder and eventually overtime can be overlooked. These are just a few of the many symptoms one may experience with chronic inflammation. Sometimes your immune system mistakenly starts attacking your own tissue. These problems are called autoimmune disorders. Chemicals, toxins, pollutants and irritants can also contribute to the onset of problems. Things such as stress, anxiety, sleep deprivation and poor diet (including smoking and alcohol) can help trigger inflammation. The most effective way to reduce chronic inflammation is to change what we eat and drink. Each one of knows when we are eating naughty or nice. With the amount of processed foods that surround us every minute of the day and around every corner, it’s no wonder that the human race has had to endure so many diseases. I've struggled with health issues since I was a teenager and when I think about it, I don’t know of anyone who doesn't have at least one family member who struggles with a negative health issue or disease. Look around; we are surrounded by illnesses such as arthritis, fibromyalgia, cancer, heart disease, stroke, diabetes, ulcerative colitis, chronic pain and many others. Of course pollution, chemicals and irritants also have a huge negative impact on our lives, which most of us have no control over. But we do have control of what we eat, so if we eat healthier and add a little daily exercise to the mix, this will help tremendously in most cases. Looking for more in-depth information on the anti-inflammatory diet? My two go to places for information are my local library and books on amazon (it depends on the cost of the books). This is such a simple read, yet a very helpful book. This book is all about the recipes and meal planning. Some of the recipes are a little extravagant for me, but it has simple recipes too. Of course there is a ton more books to choose from when you start looking around. Hopefully this information will at least help us cut down on some unhealthy foods. Bye for now, and I hope you all have a wonderful month.